Will interest rate rises leave you struggling with your mortgage? 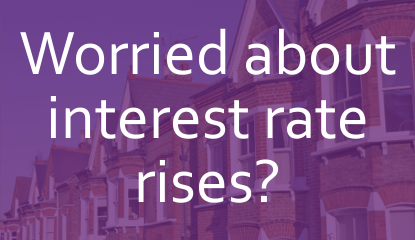 Don’t get caught out by interest rate rises! There’s been a lot of talk over the last few years about interest rates going up. Lots of opinions and lots of speculation, but what does it mean in real terms? Do you know what would happen if your mortgage increased 2%? Have you got a plan in place? It might sound quite daunting but it’s better to be prepared. That’s why we’ve covered some of the likely questions you’ll be asking yourself if you’ve got a mortgage and worry that an increase could tip your finances over the edge. But first things first, let’s talk about “base rates”. What’s the base rate of interest? The base rate of interest is set by a group called The Monetary Policy Committee. They meet up once a month to decide what the Bank of England base rate of interest rate should be. Since March 2009 the rate has been held at the historic low of 0.5% (accurate as of November 2014). It’s the rate of interest the Bank of England charges other banks to borrow from them. The reason people worry about the base rate is that banks and mortgage companies use it to work out the rate of interest they charge to their customers. So a rise in the base rate is likely to mean that mortgage interest rates go up too. Are interest rates going up? We don’t have any inside knowledge about interest rate rises but it seems that the experts in the press are predicting that the rates are going to go up in the next year. They don’t agree about exactly when this will happen. Some reports have predicted a rise in February or March next year and others have said it could be next autumn or later. The truth is that nobody knows for sure but the experts all seem to think a rise is on the cards. How will interest rates rise? It’s likely that an increase in interest rates will occur gradually rather than one sudden leap. It’s typical for the base rate to be changed by 0.25% at a time, so there’s a steady increase. This might not sound very much, but a 0.25% increase on your mortgage interest rate could mean your outgoings are suddenly harder to manage. 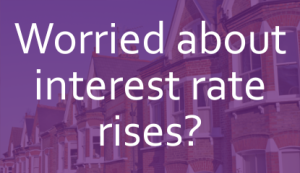 Will my mortgage be affected by interest rate rises? Variable rate (or standard variable rate) mortgages: It’s very likely that the mortgage companies will put their variable rates up to mirror the rise in the Bank of England base rate, but this isn’t guaranteed. Fixed rate mortgages: If you’re in a fixed rate mortgage then your payment will stay the same for however long your fixed rate lasts. Once your deal ends then you’re likely to return to the mortgage company’s standard variable rate, so that’s when you’re likely to feel the impact of any rises. Tracker mortgages: If you’ve got a mortgage that tracks the base rate of interest then it’s certain that increases in the base rate impact your mortgage payment. If you think you won’t be able to cope with increased mortgage payment then you could explore the more drastic steps of downsizing to a cheaper property or changing to rented accommodation. But you should always look at this as a last resort. Can I get a better mortgage deal? Mortgage companies can be very selective about the type of people they’re willing to offer their products too, particularly when they’ve got good deals available. This is fine if you’ve got a perfect credit score and plenty of equity but can make it hard for many people to qualify. Choosing the right mortgage means taking into account a lot of factors beyond getting the cheapest payment, so it’s important to be careful before making any decisions. I’m in a debt solution, how would a rate rise affect me? Debt management plan (DMP) – If your mortgage goes up while you’re on a DMP then it’ll be a matter of contacting your DMP provider and explaining that you’ve got to change your budget. As mortgages are a priority payment the budget will need to be adjusted to cover this, which either means reducing costs elsewhere to cover the increase, or decreasing the amount of money available to your non-priority creditors. Individual voluntary arrangement (England, Wales or Northern Ireland) or Protected trust deed (Scotland) – Contact your insolvency practitioner (IP) and they’ll be able to guide you through the options. Depending on how much your payments will need to change, you may be able to reduce your payments without asking the creditors for agreement. If the reduction is larger, your IP may need to ask your creditors before changing the payment. Bankruptcy – If you’ve gone bankrupt but remain in a mortgaged property then paying the mortgage is still a priority payment. If the mortgage has gone up then you’ll need to notify your official receiver of what’s going on. If you’re on an income payment arrangement it may be that you need to reduce the payment to make room for the extra mortgage expense. If my mortgage went up it would tip my finances over the edge. What do I do? A recent ICM report revealed that a third of mortgage holders would struggle if mortgage rates go up, so you’re not alone. If you’re worried that your finances are teetering on the brink then it’s probably a good idea to get some advice. Our Debt Remedy advice tool will guide you through a household budget and allows you to adjust your mortgage costs to see how you’d manage an increase on your mortgage. What happens if we split up during our joint IVA?